September 12, 2018 at 10:41 am. Tampa Bay Buccaneers quarterback Ryan Fitzpatrick was named the NFC Offensive Player of the Week by the NFL on Wednesday after throwing for four touchdowns and rushing for another in the team’s season-opening win. Fitzpatrick threw for a career-best 417 yards and also rushed for 36 more in the Buccaneers’ 48-40 victory versus the NFC South-rival New Orleans Saints on Sunday. His 453 combined passing and rushing yards are the third-most in a game in Buccaneers’ history. Fitzpatrick received his sixth career Offensive Player of the Week award, having earned the honor with the then-St. Louis Rams (Week 12, 2005), the Houston Texans (Week 13, 2014) and the New York Jets (Weeks 14 & 16, 2015; Week 2, 2016). Also on Wednesday, Kansas City Chiefs quarterback Patrick Mahomes was named the AFC Offensive Player of the Week. 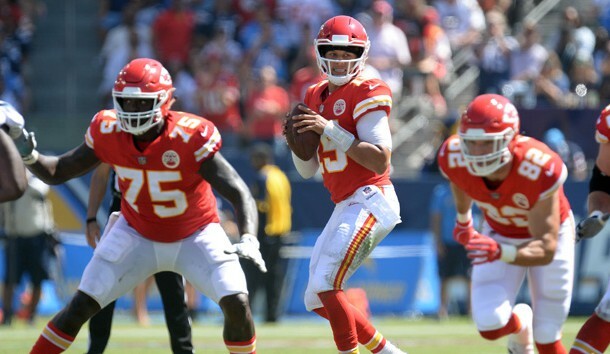 Mahomes threw for 256 yards and four touchdowns while also rushing for 21 yards in the Chiefs’ 38-28 victory versus the Los Angeles Chargers. Mahomes will test his mettle in Week 2 against the Pittsburgh Steelers and linebacker T.J. Watt, who collected 11 tackles and four sacks in Sunday’s 21-21 tie against the Cleveland Browns. Watt received AFC Defensive Player of the Week honors on Wednesday. Minnesota Vikings safety Harrison Smith earned NFC Defensive Player of the Week honors after recording eight tackles, a sack and an interception in Sunday’s 24-16 win over the San Francisco 49ers. Miami Dolphins wide receiver/kick returner Jakeem Grant captured AFC Special Teams Player of the Week honors after totaling 125 yards on two kickoff returns — including a 102-yard effort for a touchdown in Sunday’s 27-20 win against the Tennessee Titans. Los Angeles Rams kicker Greg Zuerlein received NFC Special Teams Player of the Week honors after connecting on four field goals — including one from 55 yards out — in Monday’s 33-13 win over the Oakland Raiders.